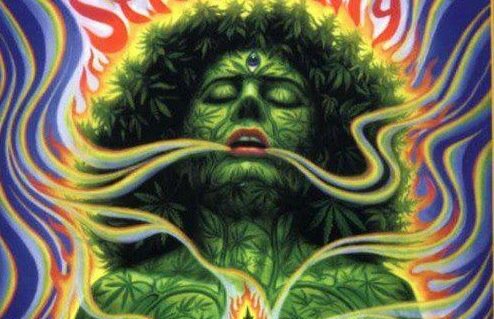 Home » New Posts » Marijuana & Spirituality: What Is The True Relationship? Marijuana & Spirituality: What Is The True Relationship? The question of what role cannabis plays in my spiritual experience has been a topic of great evaluation in my life in recent years. The plant has played an interesting role in my journey of self-discovery, aiding me in times of emotional hardship as well as being a catalyst for some of my more profound observations about reality and my own existence therein. I believe that all plants are teachers, they hold within them a primordial wisdom without the limitations of the mind, and through the use of these various plant teachers we are able to expand our normally restricted ways of thinking. But as much as we can learn from cannabis, can this plant be just as much of a distraction from the truth? There are a few things to consider, one of these being someone’s vibratory state, and the other being their intent. Cannabis has been used as a spiritual drug since 3/2000 BC, indigenous to ancient Central and South Asian cultures. The reason being was for its psychoactive properties, the ability to alter one’s state of consciousness. By altering one’s state of consciousness, we are able to view our reality from a different perspective, one that differs from the normal confines of the 3D reality. For thousands of years, Shamans held the knowledge that each plant contains a unique set of frequencies that could ultimately teach us a new way of thinking and being. Accordingly, cannabis can teach us about a number of things such as the path of least resistance, oneness, surrender, release, letting go, inhibition, the present moment, communion, allowing, the fear behind the insistent ego, and the effortlessness of being. “People react differently to cannabis, that’s because people hold different vibrations and vibratory rates, when a person with their unique vibratory rate shares the space with a cannabis plant, the person’s vibration has to match the vibration of the cannabis plant, otherwise they cannot share the same space”. In shamanic tradition, plants were thought of as gateways or portals between realms or dimensions, and the vibratory relationship between the person and the plant was called friending. We friend the plant so the plant can allow us to pass between realms. Cannabis inhibits the brain from functioning at a normal capacity, which provides a great deal of relief for many people who are bombarded by their own resistant thoughts. The brain is a transceiver of information designed to keep the illusion of a static three dimensional world. When the brain is inhibited by a substance it begins to dismantle the 3D reality it is used to transcoding, and a person is able to see beyond their normal dimensional realities. Furthermore, Teal goes on the explain, cannabis sometimes allows a person the most of his/her own true being to be fully present or unrestricted. So why is it that people react differently? Teal claims there are two reasons. The first being that someone’s vibration may be higher or lower than the plant. If someone with a lower vibration than cannabis uses the plant, it is likely they will feel better because the plant raises their vibration. Conversely, if someone with a higher vibration ingests or smokes the plant, they will most likely feel worse, experiencing feelings of paranoia or sadness. The second reason involves intent. Cannabis enhances the truth of the universe, which is intention directs energy and creates your reality. If you do not set an intention before you use cannabis, then it is going to respond to the intention of your subconscious. For example, if your subconscious fears the loss of boundaries, or wishes for you to know something that is buried in the subconscious, then the ingestion or inhalation of cannabis will surface these subconscious fears and emotions. This is why many experience the paranoia associated with cannabis use. One of the main benefits of cannabis use for most people is that it helps to release resistance. It is perhaps the best spiritual drug to help with this challenge. It forces the mind to let go of thoughts, which induces a stress reaction for the body. This is why it is the best release of stress for people with anxiety or pain, as pain is a form of resistance. It forces a person to go with the flow, and allows more of their true being to be present, hence why people experience such profound spiritual experiences while using cannabis. The situation gets sticky when advocating for the use or non-use of cannabis. This area is grey because it is an individual case for every person. What can be said, however, is that when cannabis is used without intent, and a person uses the plant on a regular basis to escape resistance, then there is likely no more personal lessons or growth proceeding. In this case, a person can be addicted to the escape, and is ultimately holding themselves back with regards to their personal development and spiritual expansion. They become unable to reach the organic space of non-resistance without the use of the substance. Although not always defined as, marijuana is an addictive substance, whether habitually, psychologically, or physically, it is an easy escape route if used in that manner. Addictive means that we are dependent on a substance to produce a feeling state. Ultimately, we have the ability to reach these states without the help of tools, even though these tools can yield many benefits if used respectfully. It’s important to remember that stress and resistance are what make us grow the most. Denying these two feelings is cutting your expansion short. If resistance is creeping up, then there is always something that needs to be addressed or looked at. Covering up these sorts of things with cannabis can be bypassing the root of the issue, therefore preventing you from fully learning. That being said, there are many cases in which cannabis use can be beneficial. Besides the potent health benefits associated with the ingestion of cannabis concentrations, if someone is caught in a mind pattern of negative, anxious, depressive, or angry thoughts, then the use of cannabis can help break these patterns. If someone is in pain or is nauseous from a debilitating illness, cannabis can strongly aid in masking these types of agonies by eliminating resistance. In these cases the person’s vibratory rate is so low that cannabis picks them back up into realignment. All in all, cannabis should never be a long term plan in treating resistance. If we want to be expanding at our highest capacity then we need to be looking at the root of our resistances so that we can continue to move forward. Being conscious about our decisions with any mind altering substance is the most important thing we can do. However, psychoactive plants and substances are tools that were put here in our world for a definitive reason. These plants are teachers. With the proper intention put forward, cannabis and other psychoactive plants have the ability to expand our consciousness in ways never thought possible. Tagged with: cannabis and spirituality Marijuana & Spirituality: What Is The True Relationship? teal swan cannabis why does cannabis make some people feel good and some feel bad?